To celebrate London Fashion Week, online fashion retailer Boohoo asked me to pick my edit from its upcoming collections. So, here they are (for the whole story, see the Boohoo blog). Coloured jeans are top of my list as they're the quickest way to ease yourself into one of spring/summer’s biggest trends: pastels. Team with a simple white tee for an effortless look. And I love the scalloped edge on these shorts – they're so cute and a great way to work block colour. Wear with the simple, sleeveless blouse, statement ring and shoes for a smart, chic look. Like my edit? Well, you can win it! To enter, leave a comment on the Boohoo Facebook page saying how you'd style my key items. The competition ends at midnight 22nd February 2012. Wait up, there's more: Bargainista Fashionista is pleased to offer a £100 Boohoo voucher for one lucky reader. To enter this competition, become a fan of my Facebook page and leave a comment about my Boohoo picks on my Facebook wall. The competition ends at midnight on 4th March 2012. Click here to go to my Facebook page now. Good luck! 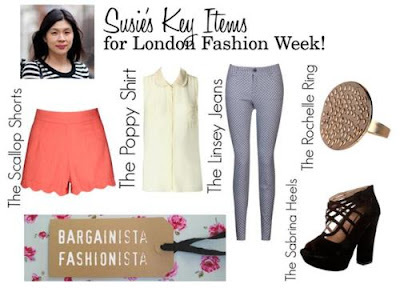 The shorts are my favourite - I love the scalloped hemline. Omg I love love love the shorts and the shoes!!! Amazing picks! Bargain spot: Cambridge Satchel for £20!